You see, each generation has different ideas, opinions, tactics, styles and preferences of technology they use when running a successful bookkeeping business. 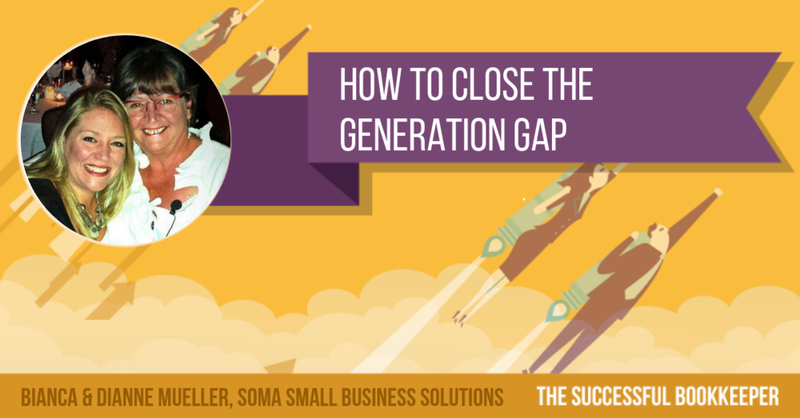 When different generations collide in a working environment (ie: you and your employees), it can be hard to collaborate at times because of their different points of view. As a result, communicating properly and getting on the same page can be a challenge. However, our guests today successfully found the solution in bridging the generation gap. They’re currently working together in helping businesses and entrepreneurs thrive. Returning guest, Dianne Mueller is the co-founder of the Institute of Professional Bookkeepers of Canada (IPBC) and owner of SOMA Small Business Solutions while her daughter, Bianca Mueller, is a second generation Certified Professional bookkeeper in Vancouver, Canada. To find out more about Dianne and Soma Small Business Solutions, visit here. To find out more about Bianca, click here. To listen to Dianne's past episode, discover here. To reach Dianne, you can email her at dianne@simplysoma.com.